The situation in Honduras is confused. The elected president, Mel Zelaya, has been removed from office and exiled to Costa Rica. President Obama and Secretary of State Clinton see this as a straightforward military coup and demand that Zelaya be restored to office. Others look at the details of what happened and see a popular democratic movement. Not surprisingly, there’s a left-right divide in American views on the subject. Zelaya, elected in 2005, originally appeared to be right-of-center. Then he fell under the sway of Venezuela’s Hugo Chavez and began to change. Recently he attempted to emulate Chavez by changing the constitution of Honduras to permit himself to serve more than one four-year term as president. However, the process he undertook was judged to be unconstitutional by the Honduran attorney general, Congress, and Supreme Court, which ordered the military not to facilitate the referendum Zelaya sought. 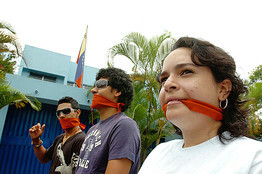 With the assistance and support of Chavez, Zelaya then attempted to carry out the referendum on his own. Finally, the military arrested Zelaya and removed him from office. On one side, Zelaya, with the support and possibly the encouragement of Chavez, tried to change the constitution to his benefit. On the other side, the Honduran Congress, Supreme Court, attorney general, and military leadership — not to mention significant numbers of the people — said he was wrong and should stop. He refused; they fired him in the only way available to them. Obama and Clinton side with Zelaya (and Chavez) against the rest of the Honduran government and the people. That bothers me. This wasn’t a typical, old-time “banana republic” military coup, and our government should know the difference. What also bothers me is the gratuitous line in the Reuters report below that the reaction of Obama and Clinton “pleased Latin American countries bitter about the long history of U.S. intervention in the region.” I wonder how many Latin American countries other than those controlled by Chavez, Castro, and their ilk are pleased by American support of Zelaya, considering that his country acted on its own to remove him? Following are excepts from the Reuters report on the Obama and Clinton reactions, a Washington Post editorial that supports restoration of Zelaya but recognizes the reality of the situation, and a Wall Street Journal article that presents a detailed review of the facts. U.S. President Barack Obama said on Monday the coup that ousted Honduran President Manuel Zelaya was illegal and would set a “terrible precedent” of transition by military force unless it was reversed. Though it might look similar, this was not a 1960s-style Latin American coup in which an authoritarian military toppled popular democrats. Until Sunday, it was Mr. Zelaya who was attempting to undermine democratic institutions, including Congress and the Supreme Court. Elected in 2005 on a right-of-center platform, the Honduran president had lately fallen under the spell of Venezuelan President Hugo Chavez. In an attempt to follow Mr. Chavez’s example, he was trying to summon an assembly to rewrite the constitution and overcome the term limits that would have forced him to leave office at the end of this year. But Mr. Zelaya declared the vote on his own and had Mr. Chavez ship him the necessary ballots from Venezuela. The Supreme Court ruled his referendum unconstitutional, and it instructed the military not to carry out the logistics of the vote as it normally would do. The top military commander, Gen. Romeo Vasquez Velasquez, told the president that he would have to comply. Mr. Zelaya promptly fired him. The Supreme Court ordered him reinstated. Mr. Zelaya refused. I wonder why Obama is so insistent about “meddling” in Latin America when he vowed not to meddle in the Middle-East. Its bothersome to many when our president takes the side of dictators — as he is doing more and more often.